I was a full time CTM and had a client for over 2 years. When I was promoted I had to leave his team to help kiddos in a different region, but I have recently returned to his team to help with coverage. He was overjoyed to see me and works harder than ever to earn hugs and praise! I am so proud of his progress with his communication device and self-help skills and his eagerness to show it off to me! 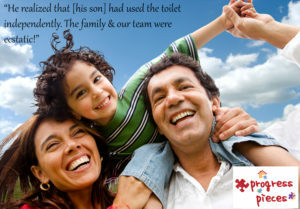 -Michelle C.
I have a client with whom we have been working on toilet training for just over a year. Previous to our intervention, the family was having no success. Just yesterday the mother called me and told me that the father had walked back in the house from outside. He noticed that the client’s pants had been pulled down. The father assumed that the client had had an accident somewhere on the floor. When the father took the client to the bathroom to get cleaned up, he realized that the client had in fact used the toilet independently and was instead seeking out assistance for his pants. The family and the team were ecstatic!! -Rosie Y.